My first request vector! Yay~ Kitten-chan asked me to vector this image for her. At first I declined because I thought I was going to be busy with other things, but turns out I wasn't so I decided to do it. As I told Kitten-chan this isn't the type of scan that I'd usually do; a beach scan. Kinda like fan service, ne? Plus I know nothing about Code Geass or Suzaku and Lelouch. Lol, but it was what Kitten wanted, so I did it for her. Thanks to Kitten-chan for choosing the title! Now, this vector was a fun challenge. There were lots of little details I had to deal wih, and I took my time with every one of them. I really tried my best with everything, and I'm pretty pleased with the end result. The vector came out nice. Easiest part: Hm, nothing in particular, just the main colouring. Most fun part: The design on Suzaku's shorts. Anyways this vector took a while (and had a heck of a lot of layers...and Photshop didn't wanna cooperate with all those layers...) but it was fun, plus it fit with my little self-improvement mission that I'm on (taking on harder tasks, doing harder vectors, stuff like that). So I hope you Suzy & Lulu fans like. Kitten-chan, it's for you, so I hope you like it as well! Any comments, faves, and full-views are appreciated! Nice blend of style with the crisp bold characters to the soft out of focus background. Wonderful work, absolutely fantastic vectoring! HOLY CRAP...You vectored the background? Oh, the harsh evil of painting backgrounds, I love you, Ashy-chan, this is absolutely gonna be one of my all-time favorite Code Geass vectors! this! is an amazing vector! i like the colors and the outlines and the painted parts! Oh my god, I can't believe you vectored the whole thing. It's amazing and beautifully done. Omg yes I love it! it look so much like the scan. Awesome vector. I absolutely love how u vectored it and the bg looks great too! It looks amazing! The vibrant colors and the great definition of all details! Perfect! 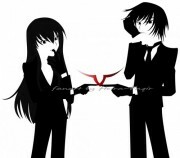 I still haven't watched this anime, but Code Geass' art is definitly awesome! Wuyoh! This vector is really awesome! Love everything. 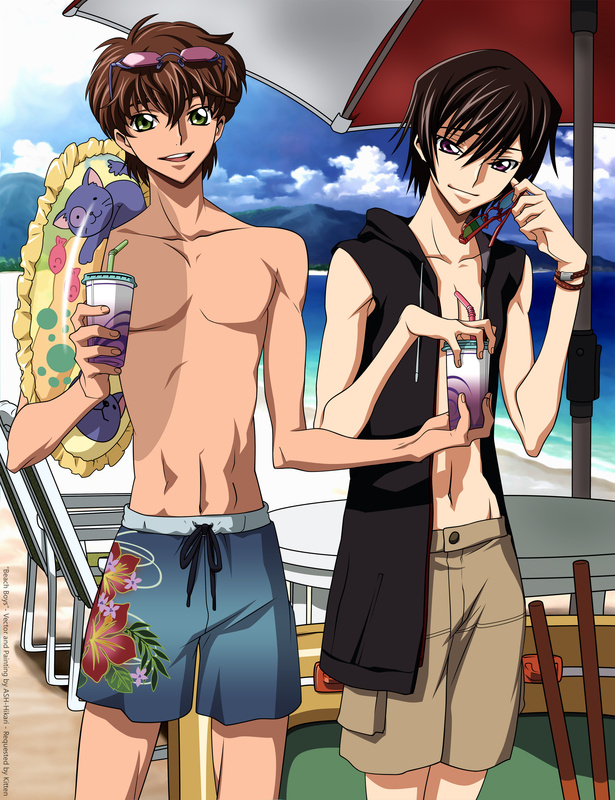 Lelouch and Suzaku look great! Wow! Very nice. The detail is good and the lines and such are very smooth. The boys look so good to... lol. Very lovely! love the outlines! great as always! so much detail! really really nice! O_O completely amazing! the details make me speechless! great job! Wow, you have some killer vectoring skills!